The Hotcakes Commerce community was recently restored a few months ago when version 3.0 was released. This was welcomed with a lot of enthusiasm since our community was once very large and strong. There was a bit of gamification in the previous community, and we wanted to ensure that we still had that kind of experience with the new one. This article will help you get to know a bit more about the new community features that give you rewards. Hotcakes Commerce is an open source e-commerce CMS that's built to make e-commerce easier for everyone on your team. When you use Hotcakes, your online business is almost instantly future-proof - flexible enough to grow with the success of your business. We knew that there wasn’t going to be a single place or way that our community would want to participate, so it was important for us to keep this in mind as we rolled things out. On the Hotcakes Commerce site itself, there are several community-centric features that you may already know about, including forums, groups, the blog, showcase, and the partner program. Each of those will of course reward participants for their contributions, but we couldn’t ignore off-site locations. Those include GitHub, Twitter, and Meetup. Whenever you do any of the predefined activities, your user account is rewarded with points. The more points you earn as an individual, the higher you’ll appear on the community leaderboard, like shown below. The points are tallied overnight every day. If you look closer, you’ll see the exact things that you’ll be rewarded for at the bottom. The scoring details give you a great amount of insight into how you can rise to the top of the leaderboard, simply by participating with everyone. Every time you visit the website, you get a point. Every time you create a new forum post, you get 20 points. If you create an issue in a supported Hotcakes Commerce repository in GitHub, you get 10 points and so on. Here’s a rundown of each activity that you can currently get points for. Daily Visits – This is probably the easiest thing you could do. Simply visit Hotcakes.org. You’ll need to be logged in to get the points. Forum Posts – You get points every time you create a new post or post a reply to an existing thread. Forum Views – The forums track every forum thread you view. Every time you do this, you get points. GitHub Issues – Issues in GitHub are the way we keep track of bugs and enhancements that need to be made. You can currently get points for creating issues in the CMS, Core, Test, and App-iOS repositories. You need to put your GitHub username in your Hotcakes profile before you can get points. GitHub Pull Requests – A pull request is how people submit updates to repositories in GitHub. Every time you have an accepted pull request in the CMS, Core, Test, and App-iOS repositories, you get points. Registration – Create a new user account on Hotcakes.org and you get points instantly! How easy is that? Rewards – If you do something above and beyond for the community, you could be rewarded ad hoc points. Showcase Sites – Anyone can add a site to the Hotcakes Showcase. You don’t have to be a partner. You get points for every site you add, but the site gets automatically validated on a regular basis. Tweets – Tweet anything that includes @mmmcommerce OR #HotcakesCommerce in the message, and you get points! You’ll need to update your profile to include your Twitter username first. User Group – Meetup seems to be the standard place to manage user groups these days. If you create a user group that focuses on Hotcakes Commerce, you can add it to the Group directory and get points. The group name needs to mention Hotcakes Commerce though. Those are some easy ways to get recognized in the community. 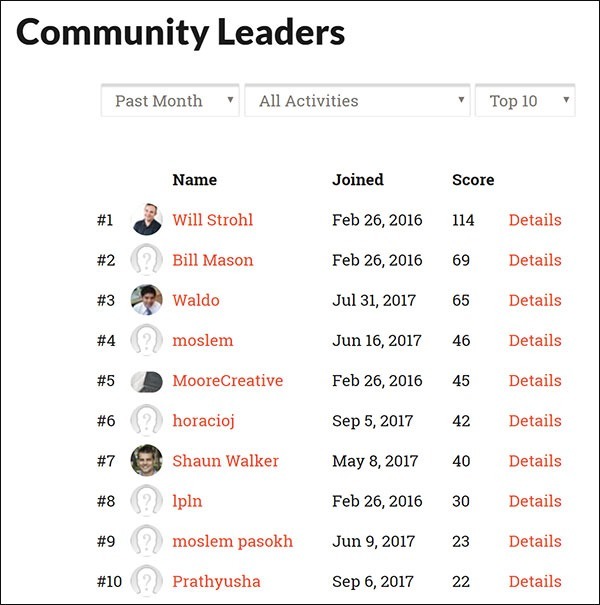 Not only will be you features automatically in the leaderboard, but you’ll get a shout out in the community newsletter if you’re high enough up on the leaderboard. Also, if you’re an employee with a partner, your points help the partner to rise in the partner directory. It was our hope that you’d enjoy these new features, but please let us know what your thoughts are, and how we might be able to make it better. Now what are you waiting for? Get to participating! I know what you’re thinking, “What do you mean, version 3.2 is out? I haven’t heard about version 3.1!” No worries… Version 3.1 did come out and it was released, but none of the marketing materials went out to announce it. I’m taking the initiative to announce both releases at this time. They are exciting releases too – with 3.1 offering support for variants in promotions and 3.2 supporting UPS Freight.